Let's just say my dining room has been in need of a tad bit of love ... okay a lot of love. The room has been a disaster zone for months now after we moved things around to make room for lil' Flynn . I finally got around to making some updates, and I thought I would share the end product with you and all of my dining room design ideas. World Market + their new fall dining room collection to the rescue. P.S. Check out below for a $5000 World Market GIVEAWAY! P.P.S. In case you are interested, here is a Peach Caprese Salad I did for World Market. I started with some new dinnerware. I am in love with these Valletta dinner plates. I paired them with some crisp white buffet napkins and these "to-die-for" Vivian Glasses. Next, I was onto buffet table setting ideas. I adorned the buffet table with some more goodies. More on that below. This Driftwood On Stand artisan piece and this wine decanter make my life (and house) complete. The decanter can be used as serveware or as a vase. More on that below. These items would make great console table decor as well. These candles from Cost Plus World Market are a refreshing upgrade to the tea light, and they smell divine. I seriously can't get over these glasses. They are just the thing for my next girls brunch. I love my new chairs too! They complete the look. The white on white makes my heart sing. I love the way the table looks set. I might just leave it this way all year long even when I don't have guests coming over. 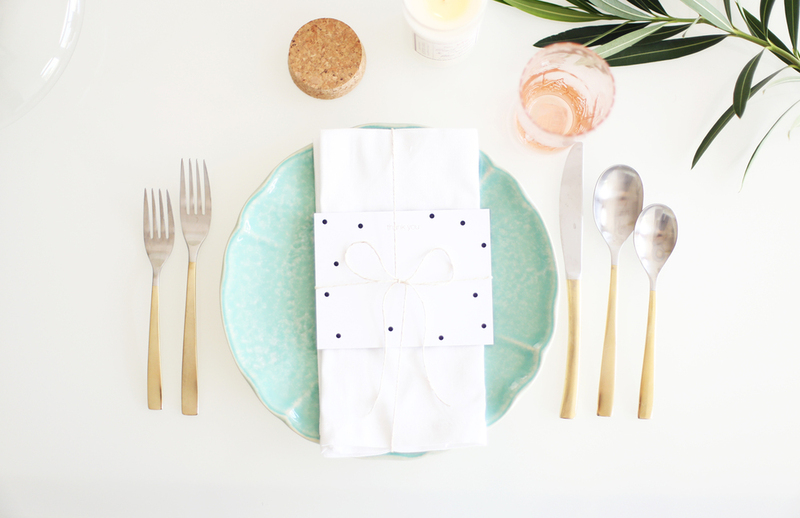 I added a little thank you note to each place setting. It's the lil' things that count, right? These Jade Cake Stands are a classic. Everyone should have them in their serveware collection. 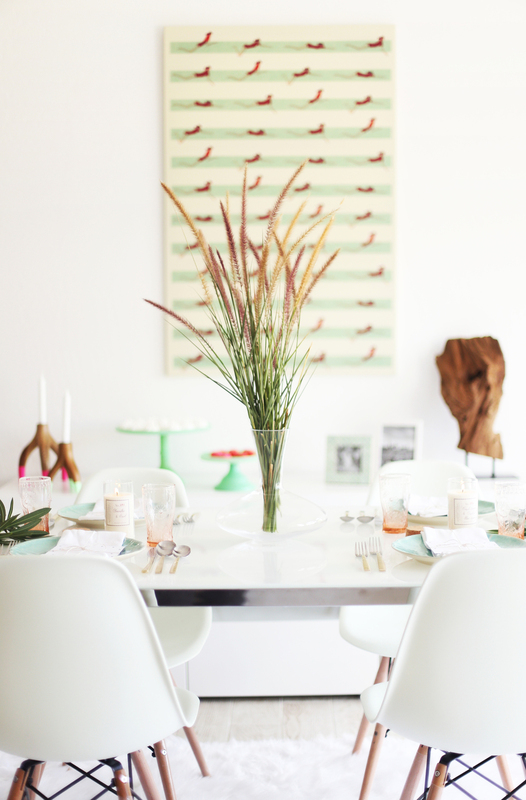 If it wasn't already obvious the color scheme I went with for my dining room was white with pops of mint + pink. 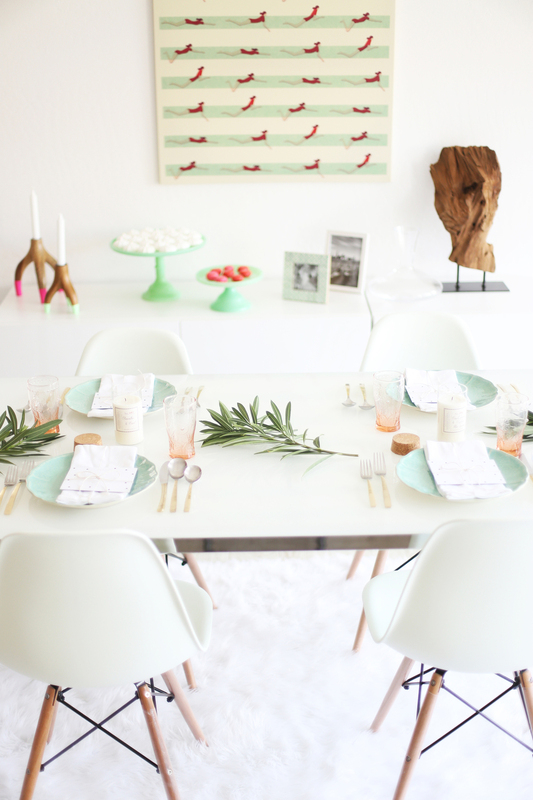 I love the combo of mint + pink for any season. Here's a cheap dining room decor idea. 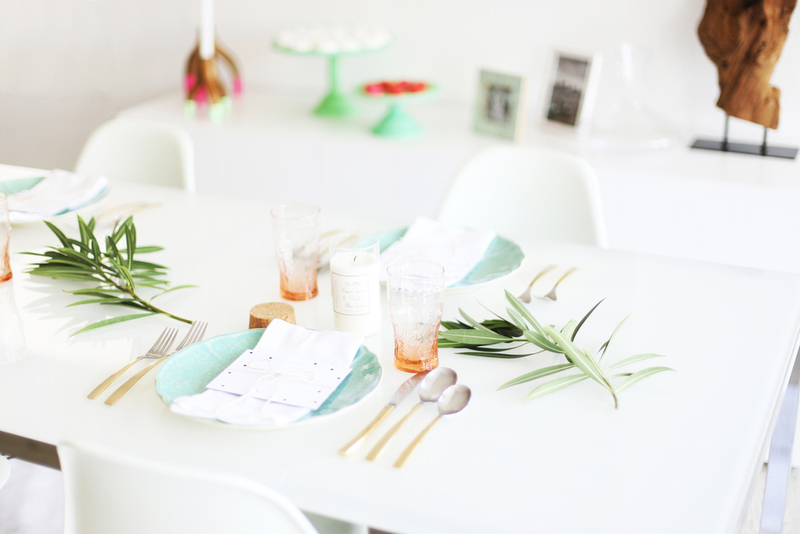 Decorate the table with some foliage from outside. With a little creativity you don't need to spend a lot of money on a centerpiece to make your table look beautiful. I think centerpieces can be minimal and lovely. They don't need to be extravagant. I get my macarons from a place called Essence Bakery here in AZ, and they are so delicious. The dining room is my favorite room in the house because there is so much natural light that comes through the bay windows. Pretty dinnerware is where my heart lies. I added some gold silverware because well I can't really do anything without a touch of gold. This white lacquer frame is just waiting to get filled with a pic of Flynny, and this mint geometric frame was too cute to pass up. Confession: this is totally the pic the frame came with. Do you guys ever leave the stock pics in frames? I'm tempted to do that with this cute zebra pic because who doesn't love zebras? Meringues are so beautiful. Here is my recipe for meringue or "forgotten" cookies. As I mentioned before you can use the wine decanter for serveware or as a vase. $1,000 World Market gift card and a FREE room makeover with Decorist Elite Designer. Be sure to head over to see how these other bloggers spruced up their dining rooms with items from Cost Plus World Market!